When I started Motoring Weekly back in 2008, I made a list of the weird cars that had been produced, mostly as a way of finding new technologies or a competitive advantage. The 6-wheeled car was at the top of my list! One of the first true 6-wheeled car was actually a racing car – and built in the late 1940s! It raced at the Indianapolis 500 in 1948 finishing 12th, 10 laps down on the winner. This car had 4 rear wheels with drive to all of them. The Tyrrell P34 was designed in Britain by Derek Gardner for the Tyrrell Racing Organisation. The company was on the downward slide after winning several F1 World Championships and they needed a competitive advantage for a new car. It was the mid 1970s and the F1 rules had changed. Gardner was trying to take advantage of them by developing a car with a very low frontal area. Using smaller 10 inch wheels gave him the design he wanted but didn’t give the grip due to the smaller rims and tyres. So he added an extra set of wheels at the front with an amazing suspension and steering package that meant that all 4 front wheels turned. 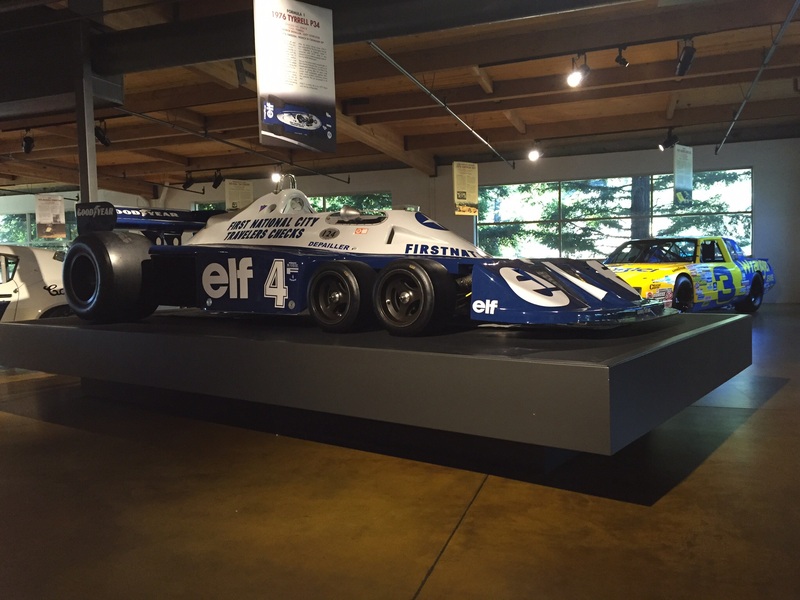 Tyrrell P34 at Canepa Designs, Scotts Valley CA. The car used the classic Ford DFV and Hewland gearbox package and ran on Goodyear tyres. The drivers, Patrick Depailler and Jody Scheckter raced it during 1976 with mixed results – including a win (the only 6 wheeler win in F1). The next year’s model the P34B was redesigned and ended up heavier and was therefore less competitive. Ferrari, Williams and March also had 6-wheeled F1 prototypes but they never raced. Ferrari made the 312T6 prototype with 4 wheels at the rear – although they shared the same axle. In the 1980s, 4 wheel drive systems were banned and the rules changed to exclude any car that didn’t have 4 wheels, so we’ll probably never see another 6-wheeler racing. As for road cars, there have been only two serious attempts at delivering this concept in modern times – from a factory as opposed to a coachbuilt special as a one off. The first is from the same era as the Tyrrell P34 and was inspired by it. The car, the Panther Six had 4 front wheels with a massive 600hp rear mounted twin turbo 8 litre Cadillac V8 to power it. Only two were ever made and they look like something out of the Thunderbirds super-marionation series! At the launch at the Motorfair in London in 1977, Robert Jankel the founder of Panther said that they had 8 orders, so 6 people were unlucky! The car was well specced for its day with power everything and was built at Jankel’s home rather than at the factory. Panther claimed an interesting safety feature. Because it had 4 front wheels the front two would lock up under heavy braking on a wet road and clear a dry path for the remaining wheels to grip! According to the Panther Car Club web site, one of the cars has recently been restored and is in Canada and the other is now back in the UK. The other 6-wheeler road car is the Italian Covini C6W. Like the Panther, it was inspired by the Tyrrell, and looks like a mix between a Corvette and a Konigsegg. It is fitted with a 4.2 litre Audi sourced V8 pumping out about 400 horses. It uses a 6-speed box running through to the rear wheels. Interestingly the front wheels on 6 wheelers seem to be getting bigger as time goes by. The Tyrrell had 10 inch, the Panther had 13 inch and the Covini has 15 inch wheels up front. Ferruccio Covini founded his company in 1978 to build prototypes and do automotive research. They designed the C6W as a way of finding a safer car with higher grip and better braking abilities so they teamed up with Robert Bosch, Brembo, Momo and Pirelli. VM Motori who build diesels for people like Range Rover were also involved although the C6W uses a petrol motor. Have a look at www.coviniengineering.com! First published: 30th May 2016. Last Updated: 14th April 2018.